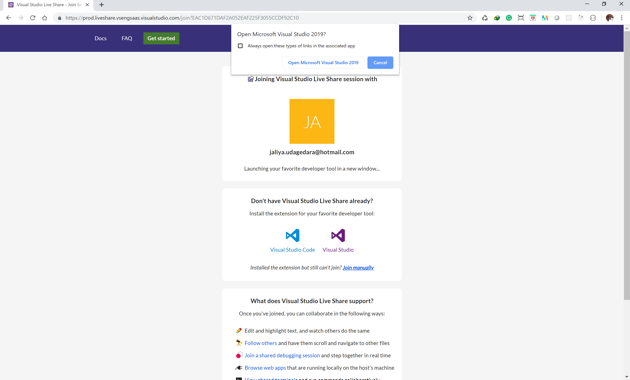 Finally, Visual Studio 2019 is released and one of the nice features which is generally available now with Visual Studio 2019 is Live Share. Live Share makes it possible to share the code that you are working on right now and collaborate with fellow developers without using a separate tool. In this post, let's see how we can use Live Share. I have some solution opened in Visual Studio 2019. There you should be able to notice this new button titled Live Share located at the top right corner. 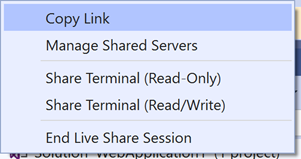 Once you click on that, you will see a prompt saying Visual Studio will now initiate the Live Share and your firewall will prompt to grant access to required ports. Once that is done, you will see the title of the button changed to Sharing and a link will be copied to your clipboard. You just need to share the link with the other user. Once he/she has the link, he/she need to open up the link in a browser. Now I am switching to my other machine and have Visual Studio 2019 installed there. As soon as I navigate to the link from a browser, I am prompted to open the link in an application. Here the possible applications are either Visual Studio 2019 or Visual Studio Code. I am selecting Visual Studio. Now the shared solution will get opened in Visual Studio and it's just like I have the original solution running in my machine. I can see when the other person is highlighting the code, when he is doing any changes etc, it's almost instantaneous. I can also see the email of the other user at the cursor point. So imagine there are many users connected to the session, I will see who is doing what. And if I switch back to the machine which I initiated sharing, you can also share the terminal with participants in Read-Only or Read/Write mode. And finally, you can end the Live Share session, and your participants will get notified. Once the sharing session is ended, your participants will no longer have access to the solution. This is a really handy feature. Do try it out. With .NET Core 3.0, you can create long running services as background services. With .NET Core 3.0.100-preview3, a new template is introduced named Worker Service. These services can be used to do things like processing messages in a queue, as a watcher etc. In this post, let's see how we can get started on creating a Worker Service. For this you will need to have Visual Studio 2019 and .NET Core 3.0.100-preview3 installed in your machine. Remember to use .NET Core 3.0 with Visual Studio, you'll anyway need Visual Studio 2019 (By the way, Visual Studio 2019 RTM is getting released today, which I am very excited about). 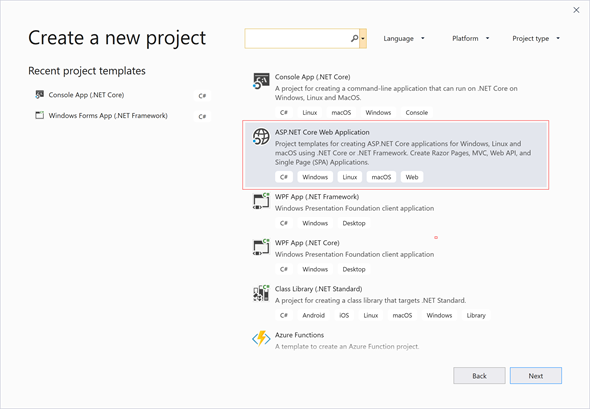 Once those are installed, you can create a new ASP.NET Core Web Application. If you are wondering why do you need to create a Web Application, the reason is, currently the Worker template is sitting inside Web Application template and this is going to get changed in the future. 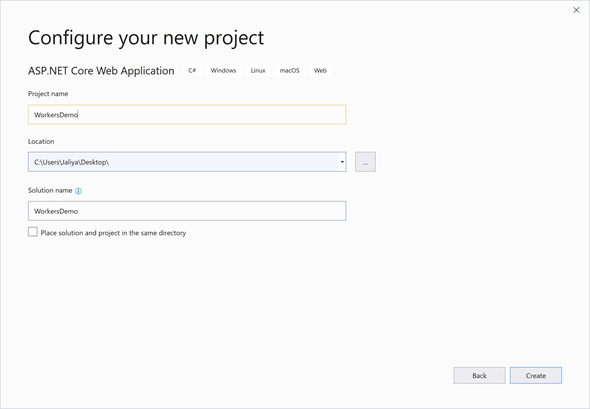 The Worker Service template will be available directly inside the create new project wizard. After giving the solution and project name, in the next dialog, you can see the Worker Service template. Make sure you have selected .NET Core and ASP.NET Core 3.0 as the target framework. When the project is created, you can see two classes are created, first one is the familiar Program. This is similar to what we used to in ASP.NET Core Web Applications, instead it directly configures services adding a service of any type which implements IHostedService. Here it's a type of a Worker. Worker implementing an abstract class BackgroundService which in turn implements IHostedService. Now if you run this, the message will get displayed until we issue an cancellation token, for instance until you press Ctrl + C etc. Now you can use this to create a Windows Service or to use as a Linux Daemon with some very little changes. 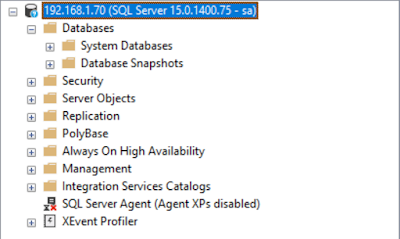 Most of the time when we are working with an application which connects to a Microsoft SQL Server database, we usually have Microsoft SQL Server installed in the local machine and have our test database/s there and doing our testing against that. With SQL Server containers you can avoid the installation and you can set up a SQL Server in a matter of minutes. 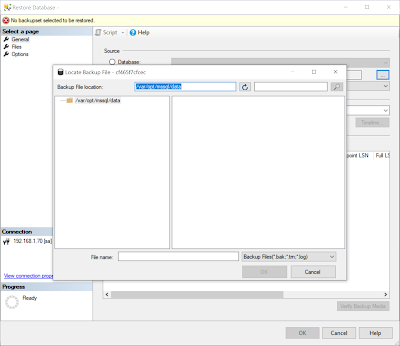 In this post, let’s see how we can setup SQL Server 2019 inside a Docker container. As of today, the latest SQL Server 2019 image is CTP 2.4. First, make sure docker daemon is running in your machine. I am on Windows and it’s making sure Docker Desktop is running. Now pull up the image from MCR (Microsoft Container Registry). If you are not aware that Microsoft has started maintaining its own container registry (like Docker Hub) and has started serving container images from there. You can find more information on that from this blog post: Microsoft syndicates container catalog). Once the command is completed, you can run the following command to make sure the image is present. Next, before starting a container from this image, you need to accept end user license and setup a sa password. You can do all this and start up a container by below command. After that if you check on running containers, you should see our sql2019 container is running. Now you have a container which has SQL Server is running. Next thing you might want is to try the connectivity. 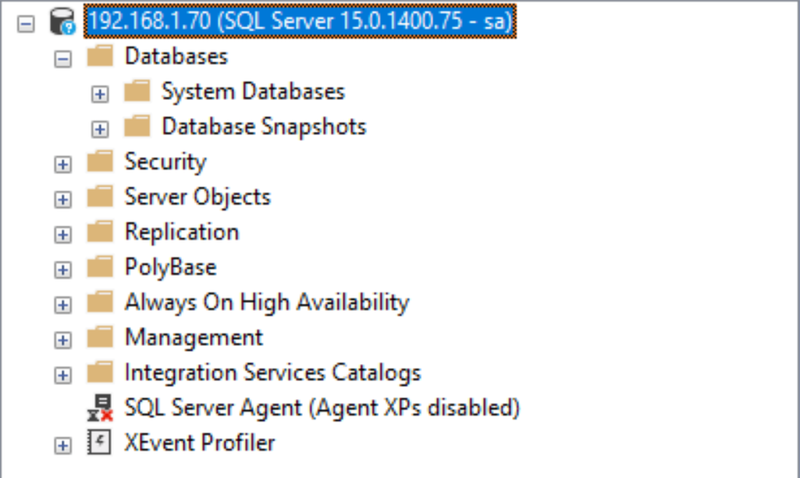 In this post I am using Microsoft SQL Server Management Studio (SSMS). I just need to get the local IP address of my machine and use it as the server name, use SQL Server Authentication and use sa credentials. It should get connected without any issues. Now if you want to restore a database, you can use either SSMS or sqlcmd. For this post, I will use SSMS. When I try to select a .bak file, of course, it’s empty. I can easily copy the file I want using docker cp command. Once the command completed, if I refresh the Locate Backup File dialog, I can see the copied file there. And from there I can select the file and do the restoration. 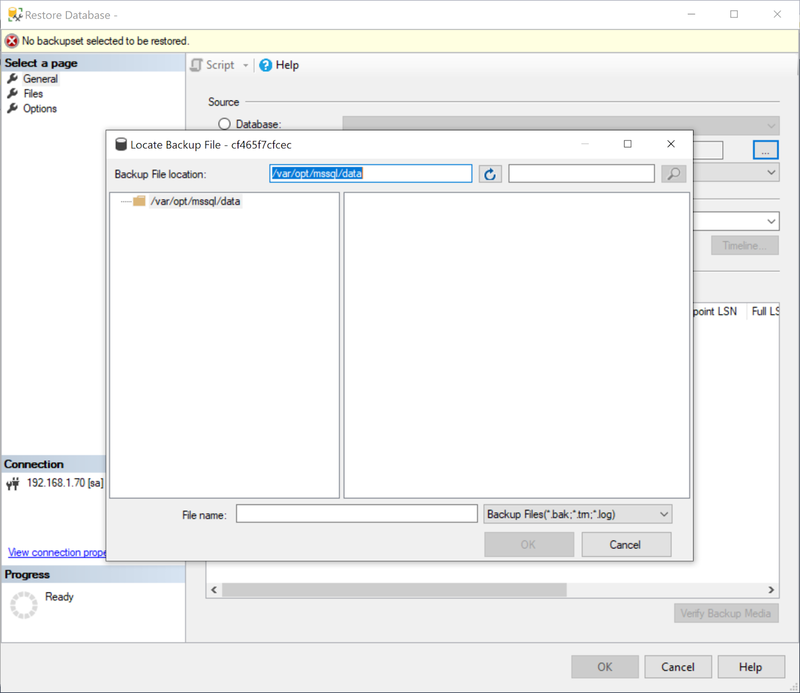 You can stop the container (in this case: docker stop sql2019) and start (docker start sql2019) it later without losing the changes in SQL Server Configuration and your databases. But if you remove the container by doing a docker rm, everything in the container is deleted, including your databases. That’s pretty neat, isn’t it. Hope this helps. Another month as a judge in Microsoft TechNet Guru Awards. And this it’s under both Visual C# and ASP.NET category. The TechNet Guru Awards celebrate the technical articles on Microsoft TechNet. Well, this time under Visual C# there were not many articles as it was used to be. Got into judging ASP.NET Category as well. Before C# 8, if you want to iterate over a collection, the data for that collection needs to be ready before iteration. Basically, something like this was not possible prior to C# 8. What you can do is something like below. But this will cause a thread block. With C# 8 comes the IAsyncEnumerable<T> which makes the yield return asynchronous. You can see that even though it’s an async method, it’s not returning a Task anymore. You can iterate over an IAsyncEnumerable<T> using await foreach making it an async stream. Wrote a post in Wiki Ninjas - Official Blog of TechNet Wiki. The title of the post is TNWiki Article Spotlight – Blazor: Creating A Reusable Grid Component. Another month as a judge in Microsoft TechNet Guru Awards under Visual C# category. The TechNet Guru Awards celebrate the technical articles on Microsoft TechNet. .NET Core Tools was initially introduced with .NET Core 2.1. Basically .NET Core tools are .NET Core console apps that are packaged and distributed as NuGet packages and is similar to NPM global tools. 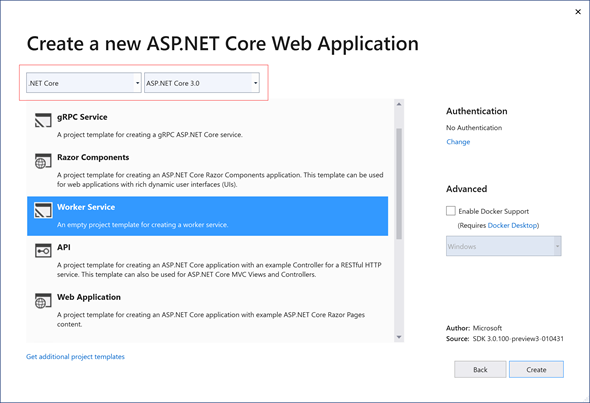 Up to the release of .NET Core 3 Preview 1.0 back in December 2018, .NET Core tools are global meaning once installed, they are available from any location on the machine for the current user. But this did not allow the different tools version to be selected per location. Say for one repository you want the specific tool version of A, and for another repository, you want the version B, it wasn’t possible, but that’s until the release of .NET Core 3 Preview 2.0. With .NET Core 3 Preview 2.0 which was released last week (29th January 2019), you can now maintain .NET Core tools locally as well as globally. In this post, let’s have a look at how we can achieve that. dotnetsay is a very basic .NET Core tool Microsoft has developed (you can find some nice set of tools here in this repo: natemcmaster/dotnet-tools). For this demo, let’s use the tool dotnetsay. To install a tool globally you can use the dotnet tool install command with --global/-g flag. To run the tool you can use just say dotnetsay from the command prompt. Note: this is the ToolCommandName which is configured in the tool. To list all of the tools, use dotnet tool list. To update a tool, use dotnet tool update. And to uninstall, dotnet tool uninstall. Basically --global/-g flag means the .NET Core tools at the machine level. To install a .NET Core tool to a specific location, you can use the --tool-path flag. dotnet tool install dotnetsay --tool-path "C:\Users\Jaliya\Desktop\dotnet-tool-dotnetsay"
The above command will install dotnetsay latest version to a folder named dotnet-tool-dotnetsay in my Desktop. With .NET Core Local tools, there comes this concept of a manifest file. You can define a manifest file which is a json file at your folder and define all the tools and their versions you like to have it there. To create the manifest file, you can run the following command. Once you run this command, you can see a folder created named .config. There inside, you can see a json file created named dotnet-tools.json which has the following structure. 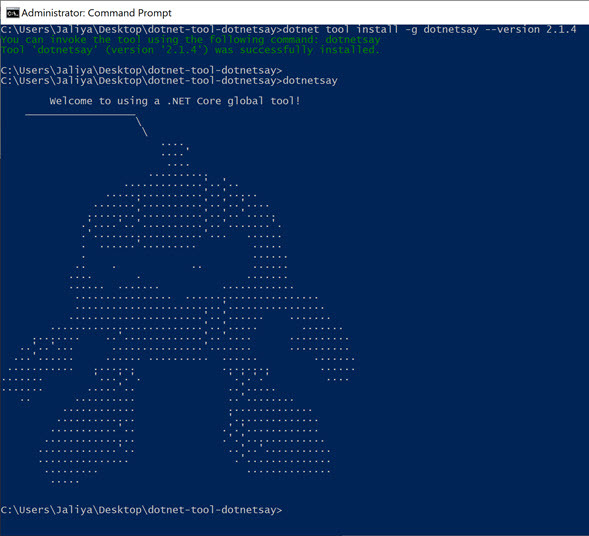 Now sitting inside your folder (dotnet-tool-dotnetsay here in my case) run the following command. And now you should see the dotnet-tools.json file is updated as follows. To run local tools, you can’t execute ToolCommandName just like you did for global tools. For that, you need to use dotnet tool run command. To see all your local tools, run dotnet tool list. And you can see the following output. There you can see which manifest is being used. One of the important things to note is, if you don’t have a manifest file inside a folder, to install a local tool, you need to specify --tool-path flag. As you might already know, Visual Studio 2019 Preview 2.0 was released and there were a couple of nice features got introduced. In this post, let’s have a quick peek on two of the most interesting things. This is really handy work. We usually interact a lot with .csproj files in the solution and so far what we used to do is, right click on the project and click on Edit .csproj. And this not that user-friendly. What if we can simply double click on the project file to open it. That will be super easy, isn’t it? And with Visual Studio 2019 Preview 2.0, that’s possible. No more right clicking on the project and select Edit .csproj, just double click on the project and the project file gets opened. Say you are trying or testing some piece of code, what we often do is creating a console application and write the code there (sometimes I use dotnetfiddle, but that’s for some basic code). And if you are just running the code and if you missed adding a Console.Read() at the end, the program will execute and the console will exit. But with the new integrated console, the program will execute and the console will stay open. And all the subsequent runs, the same window will be used, meaning you won’t have multiple consoles open for each session which can be annoying. 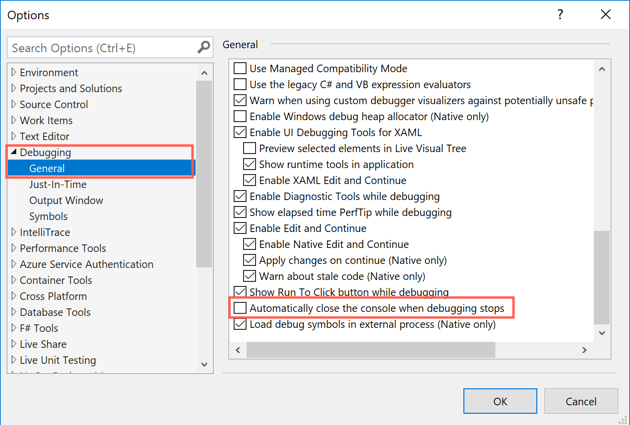 And if you want to opt-out from having the console window opened, you can do so by going to Tools –> Options –> Debugging –> General and selecting Automatically close the console when debugging stops. In this post let’s go through one of the features which got introduced with .NET Core 2.2 which is the ability to capture .NET Core runtime events within your .NET Core application. Prior to .NET Core 2.2, these CoreCLR events were unable to be consumed within your .NET Core application, it was only available to be observed in ETW (Event Tracing for Windows) on Windows or from LTTng on Linux. With .NET Core 2.2, these events are getting routed through an EventListener, so within your EventListener, you can decide what to do with it. It basically doesn’t matter on which OS you are on, it works on all Windows/MacOS and Linux. Let’s have a look at an example. I have created an ASP.NET Core Web API Application targetting .NET Core 2.2. There I have the following EventListener. Now I am enabling the SimpleEventListener from Startup.ConfigureServices method. That’s it. Now if you run the application, you should be able to see all the CoreCLR events. I just ran the same application inside MacOS, it works the same. Now, if I change the target framework to 2.1 and return the application, we can’t see CoreCLR events. This is some awesome piece of work. I am sure most of you are already experiencing the new Visual Studio 2019, and you definitely must have seen the new Start window. Personally, I like the previous Start Page, and if you feel like you are missing it in Visual Studio 2019, you are not. Go to Tools –> Options –> Environment –> Startup and change On startup, open to Start Page. Now restart Visual Studio, and when starting up, you will see that Visual Studio will open the Start Page and not the Start window. Last week .NET Core 2.2 was released with some nice features and in this post, let’s see one of them which is executing code before the Main method. As we all know the Main method is the entry point of a program. But .NET Core 2.2 is introducing this feature called Host startup hook and it provides a mechanism to execute code before executing the Main method. I have created two class library projects named StartupHook1 and StartupHook2 and both of them are targeting .NET Core 2.2. Inside both of the projects, I am adding a class named StartupHook. Note: The type must be named StartupHook without any namespace and it should be internal. And inside the class, we should have a static method named Initialize. For the sake of the post, I am just logging a message inside the method. When I build the projects, I will have two dlls, StartupHook1 and StartupHook2. Now take an existing .NET Core 2.2 application. For the demo, let’s just create an ASP.NET Core 2.2 Web Application. And to link the web application and the two class libraries (which are startup hooks), we need to add an environment variable named DOTNET_STARTUP_HOOKS to the web application as follows. We can easily do that by going to web application project properties and adding an environment variable. It’s basically something like below. Now I will just modify the web applications Main method to add some logging. Now if I run the ASP.NET Core web application, I am seeing the below. You can see that the Initialize methods in both StartupHook1 and StartupHook2 has been called before the actual entry point. And the execution order is the order we have defined the hooks in the environment variable. Past week has been amazing, there were a lot of new announcements at Microsoft Connect(); 2018. Two of them are the first previews of both Visual Studio 2019 and .NET Core 3.0 (Visual Studio 16.0.0 Preview 1.0 and .NET Core 3.0.0 Preview 1). 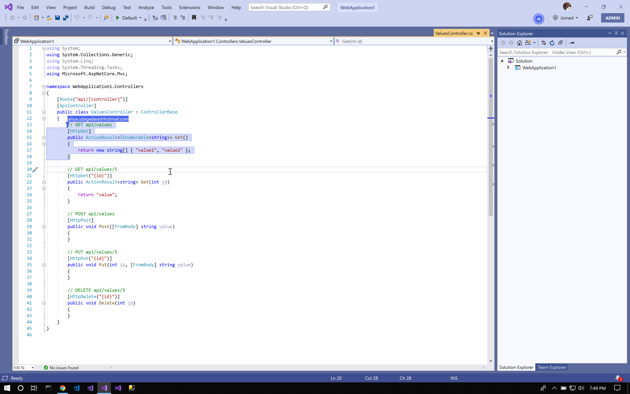 And with these, we get the opportunity to try out some of the features which will be coming in C# 8.0. In this post, let’s go through Nullable Reference Types which is one of them. Without explaining the feature, let’s consider the following code. The code is pretty obvious, you can see that when the employee is null, trying to access its property Name will throw a NullReferenceException. Now closely look at the following two pictures. First one is when we are on C# 7.3 (Visual Studio 15.9.3) and the second one is when we are on C# 8.0 (Visual Studio 16.0.0 Preview 1.0). 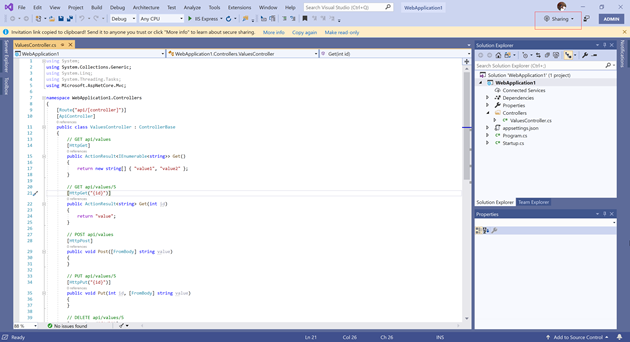 If you are wondering how to select language version in Visual Studio, check out this post. I am sure you can spot the difference. Visual Studio is not issueing any warnings in the first picture, but in the second, Visual Studio is issuing a couple of warnings. This is because C# 8.0 is introducing nullable reference types and non-nullable reference types. So starting with C# 8.0, all the reference type variables are not nullable and if the compiler sees a code trying to dereference a non-nullable reference type, it will issue a warning. But as of now, you are opted-out for this feature by default. You can opt-in to this feature (which is known as nullable contexts) using the following two approaches. This is by adding the following line to the .csproj file right after the LanguageVersion. Using a newly introduced pragma, #nullable. I am using project-wide setting for the post here. 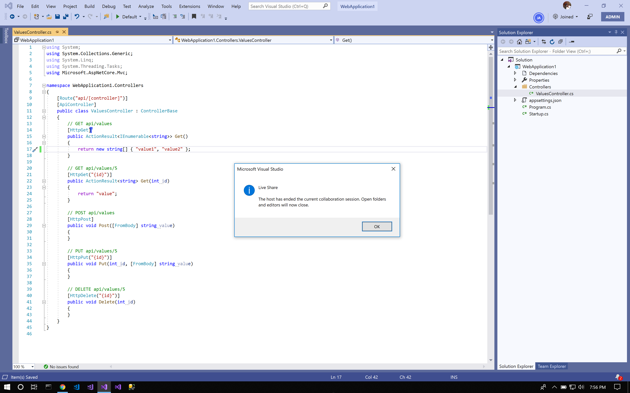 Now if we have a look at the warnings Visual Studio complains about, it has three warnings. CS8600: Converting null literal or possible null value to non-nullable type. This is because our the variable employee of type Employee is no longer nullable. If we expect the variable to be nullable, we can change the variable initialization as follows (just as we will do for values types). And prior to C# 8.0 this wasn’t possible. CS8602: Possible dereference of a null reference. Since our employee variable can be null, we need to update the code to add null conditional operator which got introduced with C# 6. CS8618: Non-nullable property 'Name' is uninitialized. This is a nice one. Name property of Employee is a type of string and string is a reference type. Now in our sample, employee is null meaning that a value for Name is not set. To fix this we can update the code as follows. And again this wasn’t possible prior to C# 8.0. This is another feature which is part of nullable reference types. Consider the below code. This will again issue us “CS8602: Possible dereference of a null reference”. If we know employee is not going to be null because of some code, we can override the warning by updating the code as below. I am sure nullable reference types will tremendously help us in writing quality code. A couple of days back Visual Studio 2017 Version 15.9 was released and it is the final minor update to Visual Studio 2017. As of now, 2 service updates have been already released and currently, it’s on 15.9.2. One of the major features released with Visual Studio 15.9 is an update to how Visual Studio Tools for .NET Core determines the version to .NET Core SDK to use with. Prior versions were using whatever the latest .NET Core SDK installed in your machine, meaning that even if you have installed a preview version of .NET Core SDK, a stable version of Visual Studio was using that preview version. So starting from Visual Studio 15.9, it will be defaulted to use the latest stable .NET Core SDK installed in your machine. 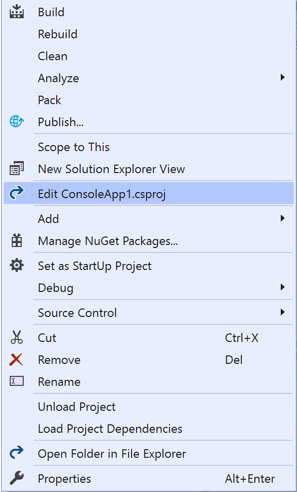 But you can always choose to opt-in to use the preview versions of .NET Core SDK in Visual Studio by going to Tools->Options->Projects and Solutions->.NET Core and selecting Use previews of the .NET Core SDK. I also have the latest preview version of Visual Studio 2017 installed which is Version 15.9.0 Preview 6.0 as of now. But in the preview versions, I can’t opt out from using the preview versions of .NET Core SDK. The option is disabled and the reason is, for Visual Studio to work properly, it needs the preview versions. Wrote a post in Wiki Ninjas - Official Blog of TechNet Wiki. The title of the post is TNWiki Article Spotlight - Blazor: CRUD Using MongoDB. In this post, let’s go through two of the important things to consider when configuring Cookie Authentication in an ASP.NET Core Application. Cookie.SecurePolicy and Cookie.SameSite plays a major role in Cookie authentication. This is an enum of type CookieSecurePolicy. SameAsRequest: This is the default. If the server has provided the cookie to the client over HTTP, then all subsequent HTTP and HTTPS requests can return the cookie to the server. If it was over HTTPS, only HTTPS requests can take the cookie back. Always: When this is set, your cookie will only sent in HTTPS requests. None: When this is set, even the cookie is sent to the client in HTTPS, all your HTTP and HTTPS requests can take the cookie back to the server. This is an enum of type SameSiteMode. This specifies how the cookie will be sent in cross-site requests. None: No mode is specified. Lax: The cookie will be sent with "same-site" requests, and with "cross-site" top-level navigation. Strict: When the value is Strict, or if the value is invalid, the cookie will only be sent along with "same-site" requests.